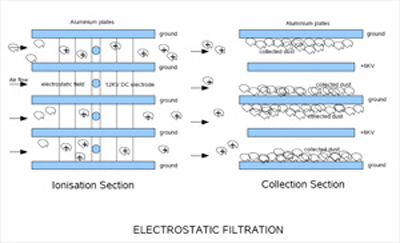 Electrostatic filters do NOT use any physical filter material such as paper, cloth, fibre etc., to capture fine particles, but uses a high voltage electrostatic charge between a series of aluminium plates instead, to first charge floating particles as small as 0.01 micron (1 micron is 1/25,400th of an inch ). These positively charged particles are subsequently collected on negatively charged aluminium plates, and the clean air , devoid of particles is sent out of the filter . The efficiency is between 95% to 100% for various particulates. 1.The Filters are permanant and are for the lifetime of the equipment .They can be cleaned as many times as required unlike standard filters which have to be replaced after a fixed time period, involving a replacement cost . 2.The filters can capture particles as small as 0.01 micron as compared to just 5 microns in standard filters. Thus Fumes such as cigarette smoke, welding fumes, etc can be captured, which standard filters cannot do . 3.The power consumption is upto 40% lower than when using standard filters. 4.The filters can be used for recovery of oil and coolant fumes in CNC machines, and the recovered oil or coolant may be reused giving considerable savings . 5.Pressure drop across these filters is very low . A two-stage electronic precipitator is constructed in two sections - a charging (or ionizing) section, and a collecting section. The charging section consists of a series of fine wires suspended between metal plates, tubes, air foils or other shapes; the collecting section is a series of parallel flat metal plates . When a continuous d-c voltage is applied to a fine wire suspended between grounded metal plates, a "non-uniform" electrostatic field is formed in the inter electrode space (area on both sides of the wire between the grounded plates). The field is non-uniform because it is very strong near the wire, but decreases rapidly as the distance between the plates and the wire increase. Increasing the voltage applied to the wire increases the field strength and its "distance gradation" - until, depending on the relative sizes, the shape of the wire, the distance between wire and plates, and the applied voltage - "corona-start" conditions are satisfied and the gas molecules (air) near the wire are forced to undergo an electrical change. The disruption of the atoms in the ionization process cause energy to be radiated. Some of this energy is of the wave lengths of visible light and under some conditions produces a bluish light around the ionizing wire, giving a visible indication of corona discharge. Lets move our attention along with the charged particles into the collecting section and see what happens there. (Incidentally, the dirt collection that occurs in the charging section or in a single stage electrostatic precipitator is very much the same as what follows). A single positively-charged particle entering this field is acted upon by a force equaling the sum of all attracting and repelling forces. These forces are due to the charge on the particle interacting with the field produced by the plates. These forces accelerate the positively-charged particles toward the negatively-charged plate. In the same manner, a negatively charged particles is forced towards the positive plates. The amount of force acting on the particle depends on the particles charge, the voltage applied to the collecting plates and the space between the plates. Other forces also act on this little particle. These forces are the resistance of the air stream, the repelling and attracting forces between it and other particles, gravity and inertia. These forces affect the movement of the particles toward the collecting plates, causing the particle to follow an approximate diagonal path to the collector plate. (From the preceding statements you can see that the velocity is a very important factor in air cleaner performance). The particles that are collected and are in physical contact with the charged collector plates lose their "opposite charge" and take on the charge of the respective collector plates. They remain attached to the collector plates because of molecular adhesion and due to cohesion to other particles already collected. Sometimes a prepared adhesive is applied to the collector plates in an attempt to increase their holding power. Such preparations may also make the plates easier to wash. Generally these preparations are unnecessary. Heavy loading of fine dry particles is one of the few situations where an adhesive may be useful. Most dirt contains enough oil, tar and residue that is naturally sticky so that washing the dirt away is of more concern than the chance of it blowing off while the EAF is in operation. Carefully washing the dirty cell at the correct intervals is the most effective means of effecting efficiency.